Old tractors and IT, same thing really. A Fowler Crawler which marked the end of a glorious history in farm mechanisation for John Fowler and Company. Will Google, Microsoft, Facebook et al follow suit? I have always found France a particularly rewarding country to visit and my latest trip over was no different for many happy reasons, one of which was further enlightenment on the behaviour of industry and the life cycle of brands and companies. This might seem somewhat at odds with the images of sun, wine and food that are normally associated with the country (and there were those as well) but travel can often be an opportunity to learn as much as it is to relax and taking in a visit to the Retromoisson* event in August kick started a chain of realisations which once again illustrate nothing much is new under the sun, even the great corporate empires of Google and Microsoft, each will have its day and then fade away. 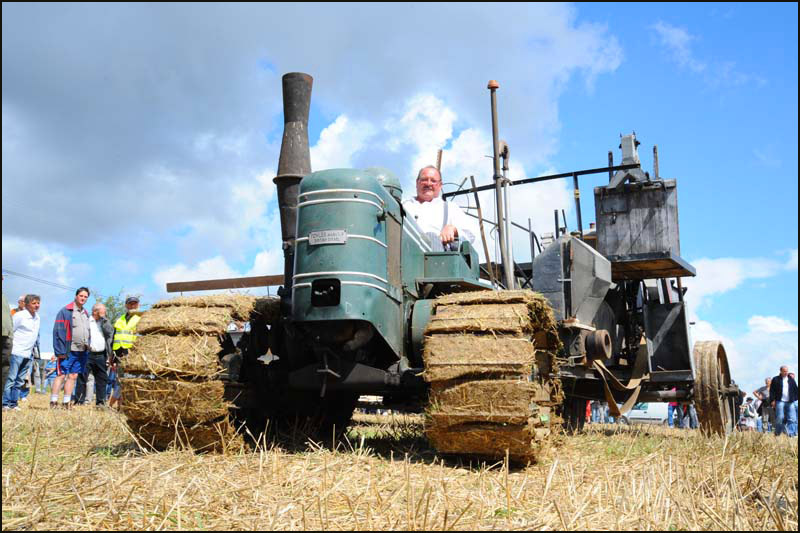 Retromoisson is basically a vintage and classic machinery event held every year to help raise funds for the museum around which it is based, and an excellent and very well organised day it is to. However, to the eyes of somebody brought up amongst the rather parochial attitudes of the British heritage scene it is either full of wretched foreign stuff or is a clear illustration that farm mechanisation was not a phenomenon led purely by the Anglo/US thrust of Ford and Ferguson, but rather a worldwide move towards modernisation, a movement that is still progressing. But not only is tractor development a dynamic and ongoing process it is also not unique to this sector of commerce but merely a repeat of the pattern that we can discern throughout the industrialised world. Two now extinct brands in particular illustrate this point and as I went on to write about them it became clear that although they produced wonderful machines that we can admire in the present they hold some clue as to what might happen to the names that are so familiar to us today in all sectors of the economy. The first is Someca; ever heard of them? Probably not, but at the most basic level Someca was a brand developed by Fiat to sell its tractor designs within France and beyond, and very successful it was to, coming second only to Renault in terms of sales volume. So what happened? Simple, tractors grew bigger and so less were needed. After the free for all of the fifties and sixties when almost anything with lugs on the tyres would be guaranteed a buyer, growers started to look for even greater efficiency from the machine that had already brought them so much. The upshot was that power per unit increased and sales volumes correspondingly declined and the industry entered a period of rationalisation from the late seventies onwards. One of the many victims of this consolidation was Someca, as was David Brown in the UK and Oliver in America, to name but just a couple of others. Having outlived its usefulness the Someca name was absorbed back into the Fiat fold although it leaves plenty of evidence of its existence behind. The second brand is Fowler which had a quite different trajectory in that is was formed by a far sighted individual (John Fowler) back in the mid 1800’s to alleviate the problem of undrained land in Ireland. To cut a long story short the company rose to be one of the leading industrial pillars, and exporters of machinery, of the Victorian era before it somehow all went wrong in the early 1900’s and they eventually ended up as a little more than a logo on a one time competitor’s tractor in the fifties. Having noted the demise of two once familiar names in their own markets the question arises as to whether the present collection of large companies that dominate society in the west can survive forever or do they too have a limited lifespan? Will Google be with us 50 years hence or does Microsft have a long term future? Both are vulnerable to changes in the market place due to their fairly narrow product portfolio and both live with the strong possibility of the advent of competitors with a superior product. In which case it occurs to me that the Fowler business model is particularly appropriate to them as Google and Microsoft have seen diversification as a way forward, as did Fowler, yet all three had, and have, a core business upon which they ultimately depend. Someca on the other hand was just brand conjured into existence to fulfill a marketing need and was later dropped by Fiat when it was no longer useful as such. Can we see a similar pattern today? Well, Nokia had great success with their phones before divesting themselves of the brand to Microsoft, the Finnish company rode a growing market but now that the market is mature they have got out of it. The company has been around for 149 years and is still going strong, will Microsoft still be with us in 2124? Plus ca change, as they say in France! *Retromoisson De Saint Loup is an annual event held every 15th of August to raise funds for FRAMAA, (www.framaa.fr) an organisation dedicated to preserving the agricultural heritage of France. This entry was posted in Uncategorized on August 30, 2014 by Triplemanr.